The R&D Core Team is reading about 16 trends that will impact education. The first 2 of these are connected with population trends, which as a geographer I'm particularly interested in. It's clear, looking at these trends, they could be moving in different directions in different parts of the world. Take for example aging. Some parts of the world are seeing a huge increase in the aging population, along with an increase in the "elderly support burden", yet others are seeing an expanding youth. The projected impact on education of these trends is a growing wave of lifelong learners with those who are retiring having the time and money to pursue their interests and curiosities, right at the time that in the developed world huge numbers of the baby boom generation of teachers are coming up for retirement. At the same time, with teaching not being seen as a very prestigious profession in many countries, there will be a growing shortage of those entering the teaching profession because of increased competition and opportunities for qualified people in other industries. 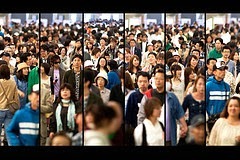 World population is continuing to grow - projected at over 9 billion by 2050 which represents an increase of over 350% in a century - and at this point the old will substantially outnumber the young in the more economically developed countries as wealth usually brings with it lower birth rates and lower death rates. At the same time in the less economically developed countries the young will greatly outnumber the old. These trends produce different challenges - in the developed world the challenge will be getting enough people for the workforce to support those who are living on a pension. In the developing world the problems may well be issues of youth un- or under-employment. Population will shift in other ways too. While trend 1 was looking at the age distribution of the population of the world, trend 2 focuses on the position of minorities. In some countries, the United States being an obvious one, today's majorities will become tomorrow's minorities - in fact the US will become a nation of minorities with no single racial or ethnic group constituting more than 50% of the population by the mid-century. I've thought about this in terms of the various international schools where I have taught and the sort of diversity I've encountered among students. We often talk about embracing diversity - but in the "real world" how often does this happen? Of course there are situations when many diverse groups come together, for example to deal with common threats such as pandemics, natural disasters, environmental destruction and so on, yet all too often the wish for one group to dominate works against the acceptance of diversity. This reminds me of the recent news coming out of Switzerland. While I lived there I noticed many posters about the Swiss culture being "threatened" as a result of immigration. Currently about 1 in 4 people in the country are immigrants and recently Swiss people voted in a referendum to bring back quotas for immigration from EU countries, believing that the free movement of people into the country has led to pressure on housing, health, education, transport, salaries and an increase in crime. I've lived in many different countries and have always made an effort to fit in as much as possible with the culture and in particular to learn the language. Many immigrants of course don't want to give up their culture, even when they have chosen to move to another country - their lives may still be an extension of their homeland just now in their new country. When I grew up in east London in the 1960s it was quite common, for example, to see Indian ladies wearing sarees with a huge sweater on top - they didn't adopt western clothing even though the climate was radically different (though their children did). Now that I live in India, I generally tend to continue to wear Western clothes except for a formal occasion like a wedding where I might choose to wear a saree. I still feel very British, in the middle of this huge and cosmopolitan city! How will these population trends impact education? Or more to the point - does our education system need to change to remain relevant given the changes in population? Should there be more focus on educating students to be sensitive about differences and diversity in the world?